It’s the summer of 1985 and everything’s about to change. At least that’s what the Stranger Things season 3 trailer wants us to believe. Set to the perfect songs – first Mötley Crue’s “Home Sweet Home” and later The Who’s “Teenage Wasteland” – the trailer definitely will take you back to the eighties and make you remember that kids just want to have fun … but that’s not an easy task for this group. 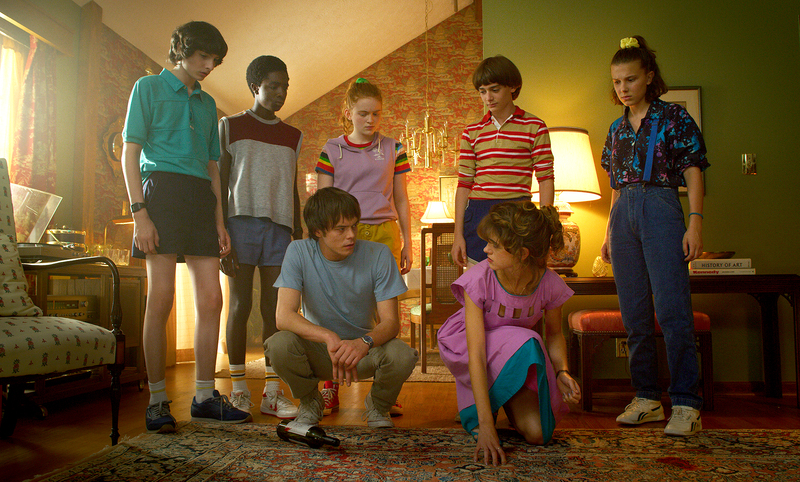 Mike (Finn Wolfhard), Eleven (Millie Bobby Brown), Dustin (Gaten Matarazzo), Lucas (Caleb McLaughlin), Will (Noah Schnapp) and Max (Sadie Sink) are back and trying to enjoy summertime in Hawkins, Indiana, but naturally, are approached by a new enemy and chaos at every turn. The trailer highlights some very important moments worth mentioning. Young love is at full bloom with Eleven and Mike holding hands in a blink-and-you-miss-it scene and sharing a kiss. Billy (Dacre Montgomery) could be possibly finding romance with Mike’s mom(! ), Karen (Cara Buono). Steve (Joe Keery) is becoming close friends – and maybe more? – with Maya Hawke’s Robin (the daughter of Uma Thurman and Ethan Hawke). The new nearly three-minute video also provides a first look at new characters played by Jake Busey and Cary Elwes, who is the town’s mayor. However, they both better keep their distance from Joyce (Winona Ryder). For Joyce/Hopper shippers – because, who’s not? – if you slow down the trailer, you may see a glimpse of the duo holding hands while running through a local fair. However, it’s possible they’re just being chased by a huge slimy Demogorgon, which is also featured in the trailer. It’s also very nice to see Eleven and Max actually becoming girlfriends and being young and having fun for a few minutes, eating ice cream and not worrying about monsters and another universe where their friends disappear. Speaking of friendships, it’s also pretty amazing to see Steve and Dustin’s budding bromance. Stranger Things seasons 1 and 2 are available to stream on Netflix. Season 3 premieres on Thursday, July 4.